As a mom, there is nothing sweeter than snuggling up with my little ones and reading. Mine love it when we make the different voices of the characters. It just makes my heart smile to hear them giggle. In the latest book by Caroine B. Cooney, hugs and cuddles are shared by various animals. I’m going to give you a bear hug. A show you how much I care hug. Hugs are shared by the dog, cat, horse, duck, pig, fish, whale, bug, and sheep! These are all special night time hugs to make a little one feel loved and cared for by their favorite things. The graphics are super cute. My little ones laugh and giggle so hard while reading this book. We have read it over and over to the point that he has almost memorized the book. This book will be on our top shelf for reading for a long time. I overheard the 4 year old reading it to his sister (1 year old). I wish I could have gotten to my camera fast enough to have recorded it. Hopefully I will be able to catch them again and share it here on the blog. This is a hard cover book with a dust jacket that measures approximately 11 x 9 inches. It is also available in a board book or kindle version. Zonderkidz™, the children’s division of Zondervan, inspires young lives through imagination and innovation. As the leader in Christian children’s communications, it creates products that awaken the hearts and touch the souls of kids under 14. Zonderkidz is also publisher of the NIrV (New International Reader’s Version) Bible translation, the third grade reading level edition of the NIV. For additional information, please visit Zonderkidz™. Zondervan is a world-leading Bible publisher and provider of Christian communications. Zondervan, as part of HarperCollins Christian Publishing, Inc., delivers transformational Christian experiences through its bestselling Bibles, books, curriculum, academic resources and digital products. The Company’s products are sold worldwide and translated into nearly 200 languages. Zondervan offices are located in Grand Rapids, MI. For additional information, please visit Zondervan. For more information, visit the author’s website. Make sure to connect on Facebook and Twitter for the latest announcements and promotions. 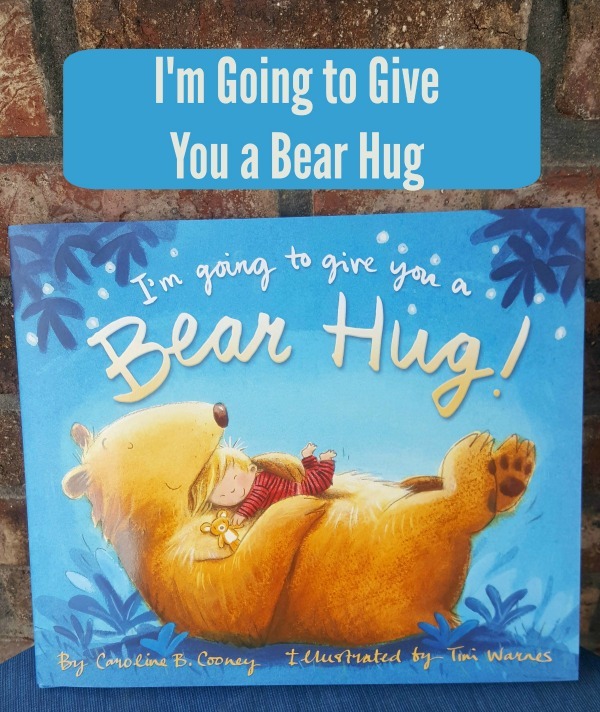 You can purchase I’m Going to Give You a Bear Hug on Amazon with free shipping for prime members. “Disclosure (in accordance with the FTC’s 16 CFR, Part 255: “Guides Concerning the Use of Endorsements and Testimonials in Advertising”): Many thanks to Propeller Consulting, LLC for providing a sample of the product in exchange for this review and post.